A mindful look into the true distinction between lack and abundance. After giving birth to a son, Kala is forced to give up her daughter. Rather than the orphanage, as her husband demands, she abandons the toddler on the sidewalk with a pack of sleeping street children. The world around the three-year-old churns with the consequences of abject poverty and soon she can’t remember the security of her bed, the satiety of a meal, or her birth name. With no awareness of life beyond survival, the child and her pack-mates focus on the present moment as they dig in garbage for food, drink water with the cows and sleep on the sidewalk. Claire Kaine, a corporate executive working in India, is totally focused on her career until she sees the tiny homeless girl bathing in the hotel fountain. Her corporate facade begins to soften. As their unusual friendship develops, the core of Claire’s life finds a new direction and their bond influences many other people, like ripples in a pond. This carefully researched novel highlights critical changes in India’s history during the 1990s. Marcia Breece tells a story of community, kindness, and hope while inviting the reader to witness the unbreakable bonds of love and the healing power of compassion. 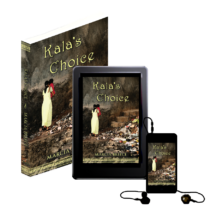 KALA’S CHOICE available in eBook or paperback through online bookstores. Independent bookstores can order Kala’s Choice via Ingram or Baker & Taylor.